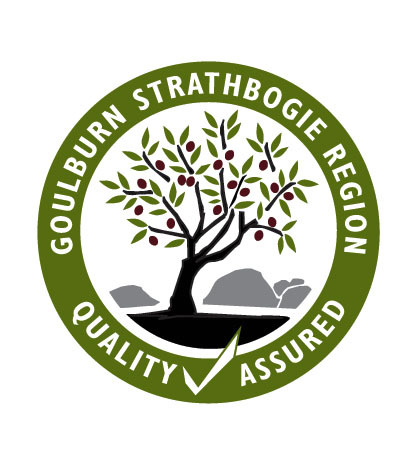 The owner of Hillcrest Estate is a member of the Goulburn Strathbogie Olive Growers Association Inc. and has been active in the development of the Quality Assurance Seal to be found on the produce of the Association members who are signatories to the AOA Code of Practice. The region has particular advantages as a source of premium extra virgin olive oil (EVOO). • The region is situated in a climatic ‘sweet spot’ for oil quality (RIRDC Publication No. 13/094). • The region is dominated by small to medium size growers who care passionately about their trees, their olives, and their olive oil. • The region is one of very few that has an active Producer Association raising the quality of local oil by educating growers on the benefits and ‘how-to’ of improving oil quality. The Association has therefore introduced a distinctive regional ‘seal’ that certifies our EVOO as originating from our region and has been independently tested for quality. • The oil has been produced in the Goulburn Strathbogie Region. • The oil meets the requirements of the Australian Olive Association Code of Practice for extra virgin olive oil. • The oil’s freshness can be assessed by date of harvest as shown on the bottle.